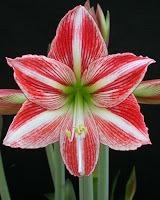 Yet another popular Christmastime flower, the Amaryllis, is actually not an Amaryllis at all, but Hippeastrum, which is native to South Africa. The true amaryllis, from Peru and Chile, is a very similar plant but growers chose to lump them all together thereby confusing us, the buying public! their appearance, they are quite long-lasting. (Keep them slightly watered, and out of harsh light). 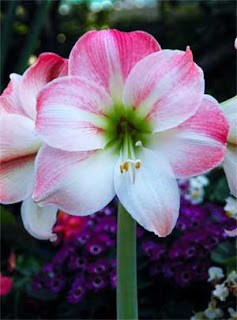 Hippeastrum boasts colors ranging from pure white to peach and pink, to deep reds and burgundies. Some of the South African specialty varieties are absolutely stunning. One in particular, called Jade Serpent sports an unexpected lime green color. assure flowers for Christmas. One I'm trying this year is called "Fairy Tale" and it promises to be a beauty with it's striped petals! 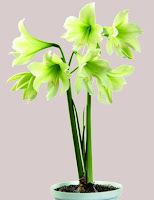 Florists use cut Hippeastrum in arrangements for the holidays, making a very dramatic statement. Can't seem to grow them yourself? Get your beauty fix by checking out the time-lapse videos on YouTube! 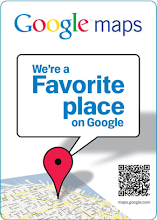 These are great for classrooms, especially in the younger grades. They get instant gratification. If first graders haven't learned about inches yet, they will come to understand this quickly. At times, the leaves grow an inch overnight! They are always amazed at the gorgeous flowers!